As has become an annual custom, Joke Vandepitte, business manager and Jennifer Vermeiren, purchaser visited the Seafood Expo North America in Boston in March 2019. Like the Seafood Expo Global in Brussels and the China Seafood Expo, this fair offers a perfect opportunity to meet suppliers. 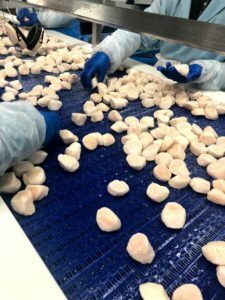 We took this opportunity to visit our supplier of Atlantic deep-sea scallops, which is located at an hour’s drive from Boston. The United States is one of the major producers of Atlantic deep-sea scallops (Latin name is Placopecten magellanicus) in the world and therefore also for Pittman Seafoods. Of the 27,000 (metric) tons of scallops caught last year, an estimated 7,000 (metric) tons or more were exported to countries outside the United States. The catch is expected to rise to almost 30,000 (metric) tons in the coming year. Our supplier is among the top 3 of the world’s largest producers and processes more than 20% of the total volume, which is equivalent to approximately 6,000 (metric) tons. It is expected that nearly 70% of the catch will consist of the 10/20 size in the coming quota year. This means there are 10 to 20 pieces in a Libra Pound (1 Libra Pound or lb is equal to 454 grams). It is furthermore estimated that 20% of the catch will be of the 20/30 size and that 10% will be of the largest U10/U12 size (less than 10 or 12 per lb). Although the fishing season officially starts on 1 April, scallops may be caught all year round, provided the stringent restrictions are strictly observed. The catch area, which runs along the East Coast of the United States from the border with Canada to Virginia, is for instance subdivided into zones that are closed until the scallops are fully grown. In each zone, the fishing boats are allocated a limited number of fishing days and trips. Each ship may have a maximum of 2 dredges on board of limited dimensions. The mesh size of the dredges must also meet certain minimum dimensions, so that smaller shells can escape. It is therefore no surprise that the American scallop has been certified to use the MSC logo. 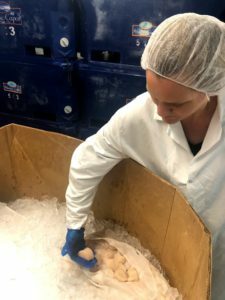 On board, the meat is removed from the shell as quickly as possible and stored in bags on ice. The boats of our supplier try to keep the trips as short as possible, 7 days at the most, in order to ensure a quality that is as fresh as possible. In winter, there is little supply due to the bad weather, since the fishing is done by fairly small artisanal boats. This means that about 60% of the total quota is caught between May and September. Our visit was just before the start of the new fishing season, and the quota was almost exhausted, but there was still quite a lot of activity in the factory. 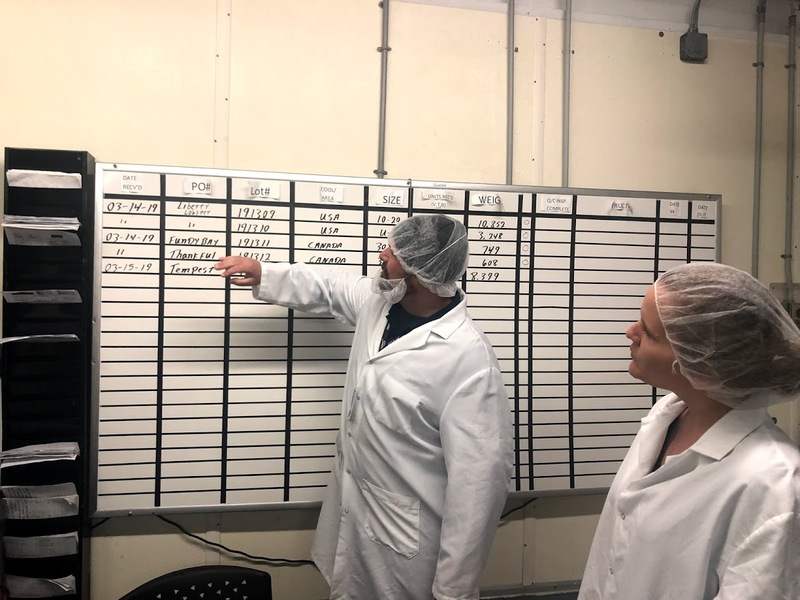 After an interesting meeting, we were shown around the production process of the scallops, which is becoming increasingly automated. Last year, for example, they invested in a new freezing tunnel to speed up the production process and to double the capacity. This year they will also get 2 extra packaging machines to automatically pack the scallops in bags. The quality manager told us that the raw material, after having been checked on the quay, is once again subjected to thorough quality checks on arrival in the factory before it enters the production process. 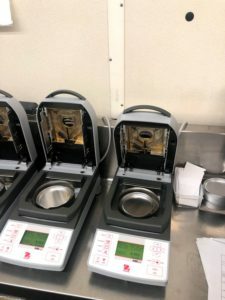 Sensory tests are performed, samples are sent to the laboratory, the size and color are checked and finally a decision is made for which production batches the various lots will be used, depending on the customer specifications. A portion is packaged for the fresh market, but most of it is frozen, sorted by size and then packed in bags with the customer’s logo or in cardboard bulk packaging. Also, during and after the production, a large number of random samples are taken for quality tests, so that the producer can guarantee that the customer will be satisfied.